Recently, a number of requests have come in for us to visit a far off planet called Jakku. It hadn’t been requested even once prior to late 2016, leaving us to wonder why it was suddenly in the minds of everyone. Tatooine? Of course. Even Te Hasa. Desert planets certainly have their attraction, whether it is for the need to hide from the Empire’s forces or the need to visit a desert bazaar in order to resupply. All know that such worlds are hardly welcoming, though. Those desert planets conjure up some major dust storms that can do more than just make travel difficult. The whipping sand could easily blind you for good. So, whether visiting Tatooine, Te Hasa, or even Jakku, you need to be prepared. Fortunately, recent views of various desert terrain planets have given us a chance to adapt our gear to keep you looking authentic while remaining safe. You can gear yourself up with this officially licensed Star Wars: The Force Awakens Adult Rey Eye Mask with Hood. 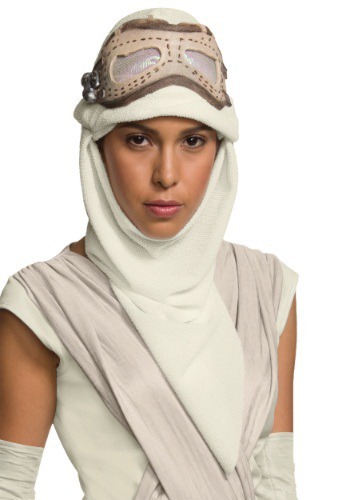 This accessory hood is the perfect complement for the rest of your Star Wars costume. This knitted hood fastens with Velcro in the back and gives you enough fabric to feel free while also keeping clean from random gusts of sand. The cowl collar can be pulled up over the lower half of your face for sudden blasts while the molded vinyl mask has a mesh covering over the eyes to allow you clear vision while seeming protection from the planet’s sands. Force powers not included, but they never do show up until you’re off the desert planet anyway! The goggles are a bit cheap looking, but for the price, I got what I expected. Consider ordering a size up. The adult fit my eight year old just right.